Spanish brand Orbea has always had a comprehensive range of mountain bikes, but it’s probably best known in the UK for its XC race hardtails. That’s all set to change, though, with the introduction of the new Rallon. Yes, you guessed it: it’s yet another 650b enduro bike. But before we delve into some of the specific details of the Rallon X-Team that I rode on the Enduro World Series trails of Finale, Italy, let’s take a closer look at the rest of the line-up. There are four bikes in total, and all share the same 160mm-travel aluminium frame. That’s right, there’s no carbon option. Prices start at a very competitive £2,199 for the Fox-equipped Rallon X30, and at the other end of the spectrum there is the Rallon X-LTD for £5,499, with a SRAM XX1 groupset and carbon Roam 60 wheelset. The options don’t end there. it’s a really well-dressed bit of kit, with the performance to match. In pursuit of the ultimate enduro race bike, Orbea has gone as far as specifying a custom-tuned spring curve to match the slack 66° head angle. On the rear, a longer than average rocker link gives a very smooth, progressive feel to the suspension. This bike is certainly race-tuned, but not in a hard-as-nails, hold-on-and-skip-across-the-top-of-the-bumps sort of way. It’s ultra-plush and is backed up by smooth, controlled damping in the mid-stroke for a planted feel that few 160mm-travel bikes I’ve ridden can match. 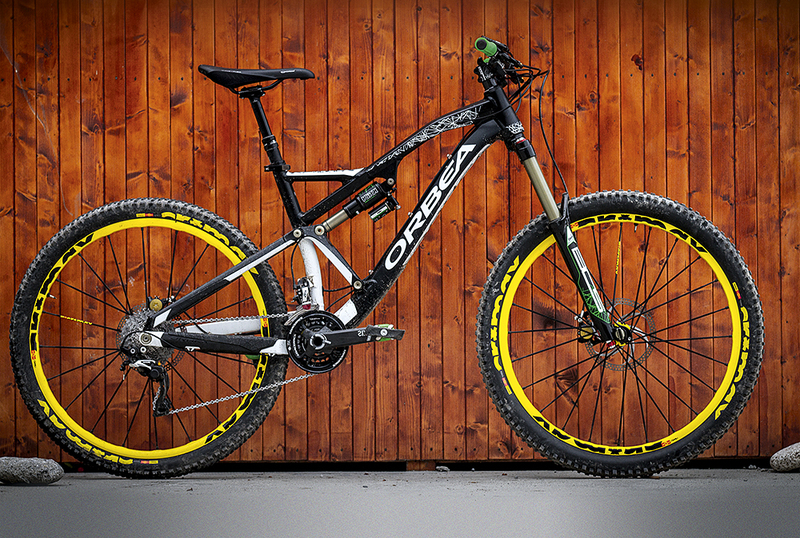 And while a lot of manufacturers claim to make long, low, slack bikes, Orbea really is walking the walk. The Rallon is so low, in fact, that it comes with shorter 170mm crank-arms to gain some extra pedal clearance. I rode it in the highest of the two available geometry settings and, as much as I love a low bottom bracket, the high setting was as low as I could reasonably get away with. No doubt this is one reason why I instantly gelled with the bike. Though the geometry-adjust feature is nice (and very clever), do you really need an even lower setting? Hardly. When I said as much to Orbea, I was told that it’s there for the kind of super-steep DH tracks where you ride the brakes rather than crank out of every corner. Given how capable the Rallon felt on the trails around Finale, it’s easy to see why it would feel perfectly at home on full-blown DH tracks. Not that we’d recommend the semi-slick Mavic rear tyre in such a situation. Still, it’s fast-rolling and perfectly suited to the design remit. In fact, the distinct lack of braking traction means you won’t scrub off too much speed and your race results could actually improve… but that’s only if you can make it to the finish line without blowing too many turns.